What Can You Do With PDF Files? Most people just print or view a PDF file, but they are more versatile than you think. Today, PDF files can have “fillable forms,” allowing you to complete a neatly typeset tax return, insurance claim form, voter’s registration, or other form with boxes for names, addresses, amounts, etc., even when you don’t have a typewriter or word processor. PDFs have a number of other tricks, such as the ability to sum a column of numbers in a form. They can even contain animated or audio content. Acrobat, the professional software for PDF management and editing is sold by Adobe for a pretty penny. But the PDF format is open-source, so a host of third-party utilities have sprung up. Here are some of the best PDF tools, most of them free. Not Another PDF Scanner 2 (NAPS2) is designed to replace the horrible, no-good, very-bad scanning software that comes bundled with multifunction printers and other scanner devices. Once installed, NAPS2 is easy to use. Click Profiles and then New to add your scanner, then edit the settings like Page size and Resolution. Click Scan when you’re ready, and an image of your document will slowly unfurl on the screen until the scan is complete. Now you can Save it in PDF format, print it, or both. An optional OCR (Optical Character Recognition) module converts images of alphanumeric characters into ASCII text. PDF Multi-Tool extracts images, video, and audio content from PDF files, and saves each bundle of extracted content to an appropriate file (e. G., .jpg, .mp4, etc.) You can export tables of data from a PDF to CSV files, or import table data directly into an Excel spreadsheet. Split a PDF file into multiple parts, or merge multiple files into one PDF. There are many other handy functions in PDF Multi-Tool and its add-ons. PDFill Free PDF Tools is a similar utility that I like. You can use it to merge, split, reorder, delete, encrypt, decrypt, rotate, crop and reformat PDF pages; add information, header, footer and watermark, to convert images to PDF, PDF to images or PostScript to PDF; delete, flatten and list form fields, and more. PDFill does not add watermarks and is free for personal or commercial use. Foxit Reader is a long-time favorite for simply reading PDFs. It can also save your PDF collection to the cloud - Microsoft OneDrive and Google Drive integration is built in - and find the right PDF again when you need it. Like NAPS2, Foxit Reader can scan documents from your scanner to PDF files. You can annotate PDFs with Foxit Reader. It even reads PDF text aloud, a boon to the visually impaired. Rapid Redact is handy if you need to redact (black out) portions of a page to protect sensitive information. RapidRedact can find and automatically redact text strings you specify, such as Social Security Numbers, credit card numbers, names, email addresses and anything else you need to remove. You can also use the 'Rectangle' tool to block out portions of a page. Libre Office Writer does a great job of opening PDF files so they can be edited in a word processor. It can also export any document to PDF format. It's part of the free Libre Office suite that does pretty much everything Microsoft Office does, but for free. Did you know that Google Drive can convert PDFs to editable text? Yep, that OCR capability is built into Drive. From your Drive, just right-click on the desired file (it can be a PDF or a JPG), then click "Open with > Google Docs." The file will be converted to a Google Doc that can be edited. There are some limitations, though. Bold, italics, font size, font type, and line breaks are usually retained, but lists, tables, columns, footnotes, and endnotes will probably not survive the journey. Also, files larger than 2 MB cannot be converted. Doro PDF Writer installs as a virtual printer, so you can print or save data to PDF files from any application that you use to print a file. Windows 10 has this feature built into it, but users of older Windows versions have had to struggle with multiple PDF savers/printers. Install Doro and creating PDF files becomes a no-brainer. Most recent comments on "[HANDY] Free Tools for PDF files"
Microsoft Word version 2013 and above convert PDF files for editing, much like Google Drive. 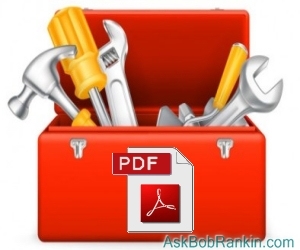 PDFill PDF tools is a free set of tools that is very good. I've used it for years. I have been using NitroPro for many years (currently I have version 10) While it is not FREE it is cheaper than Adobe and does almost as much. I plan on trying PDFill PDF tools but Bob's comment was confusing as he lists Water Marks as one of the features but then ens his comment by saying PdFill does not edit Watermarks. Tried using Apache Open Office 4.x Writer to open existing pdf file. Even though the Writer module was open, the file opened in OpenOffice Draw. Each line had a separate text box, so could be edited that way. Not as efficient as a word-processing file I don't think. I want to print Yahoo emails to PDF files, preferably by highlighting text and/or photos and clicking 'Print to file'. Any ideas among all these options? I have used Foxit Reader for a number of years and it doesn't have any popups. Like Doro PDF Writer it installs as a virtual printer, so you can print or save data to PDF files from any application that you use to print a file. Foxit keeps adding functionality and it has a small footprint. I didn't know about the scanning capability so will have to check that out. Thanks Bob. I use PDFtk from https://www.pdflabs.com/. It can do a bunch of stuff, similar to PDFill. I use it to collate two-sided scans, i.e. use one-sided scanner to scan odd-numbered pages into one file, then even-numbered pages into a second file. The second file is in reverse order. One pdftk command line collates in correct order. I use deskPDF Studio which allows me to open up and insert pictures and text in an original document. Another good program is https://smallpdf.com/split-pdf which allows me to drag PDF into it and when loaded I can cut and save sections/pages I want in a reduced size PDF. I had a success another time with Onedrive. I moved a PDF file to Onedrive and edited it with the on line version of Office 365. I didn't expect much because the formatting on Onedrive wasn't very good. The printed form, however,was just what I was striving for. Thanks Bob, for another great find. Not Another PDF Scanner 2 (NAPS2) is a joy to use compared to the one that came with my Epson scanner. Bob, I have found that a PDF Editor is more for business usage, as well as Church, Political, and an Event committee meetings. Now, please understand, I have been a homebody for almost 20 years and have yet to use a PDF Editor. Oh yes, I have had PDF files sent to me, especially the ones you can fill out (fabulous, absolutely fabulous!!!). But to create a PDF file, I have never done that, nor have I had the need to do that. However, I do love to know about FREE programs and have downloaded PDFill Free PDF Tools. It really does seem to be the easiest to do. This way I have the means to edit a PDF if I need to. Bob, another great article with several free programs that all of us can use! In all of my computer years, I have not needed a PDF Editor. But then, I do not have a business, nor am I involved with any Political or Church or Events committees. I did download the PDFill FREE PDF Tools. I have used the fill-in PDF's and they are fabulous!!! I may also need an Editor for some future paperwork. This is why I download the PDFill FREE PDF Tools. They seem to be the easiest usage, that I have seen. I use PDF creator. Great way to make pdf's from Word documents. I've used Foxit Reader for years. I don't need all the goodies and nifties - I use it to read User Manual PDFs for used stuff I pick up that don't have any documentation. Thanks for some more great info Bob. I've been using Nitro Reader 3.5 for years. It's free and has no ads. I didn't know you could edit PDFs in Libre Office Writer. I must try it. Thanks also for telling us about Not Another PDF Scanner too. Something else I want to try. Their antics generate FLAK - which is a German language acronym for flugabwehrkannonen, or in English anti-aircraft guns - By extension gunfire, in popular usage harrassing fire. Ditto to the below comment....it's the one I recommend to my students, friends, actually everyone. I'm surprised that the niftiest free document scanner has not been mentioned at all. That program is the venerable IrfanView image viewer/converter. If you have never used it for scanning purposes, I strongly suggest you try it. It accommodates WIA and Twain and has a Professional Mode as well as an Auto mode. Scanned image appears in the IrfanView edit screen which has good image tools and will save scans in 20 different formats (JPG, PDF, BMP, etc). And, unlike NAPS2, it is intuitive to use. It is not a PDF reader or editor but it is a great scanner program. You did not mention the Typewriter feature of Foxit Reader. This feature which allows text to be typed into a PDF file without making it look like a comment is the reason that I started using Foxit Reader over eight years ago. Although I use that feature less often now that fillable forms have become more common, when I come across the occasional form that does not have fillable fields the Typewriter feature is still quite handy.